Up until recently most mandarin salamanders were imported to Europe and the US from wild caught specimens originating in Thailand. In 1992 alone nearly 10,000 were exported from this region and inevitably this lead to the probable extinction of Tylototriton from this country. Since then strict laws limiting the collection of this and other amphibians have come into force and therefore this wild-caught specimens are only likely to be available in small quantities. Unfortunately such specimens still tend to be poorly treated during capture and subsequent shipment resulting in some unpleasant ailments which can prove difficult to treat (see disease section). Another better source is the increasingly successful efforts of breeders in Britain and Germany (for some reason this species is not as sought after in the US and therefore few people attempt to breed them). Occasionally juvenile and sub-adults are available in specialist herptile outlets which represent healthy individuals (if properly cared for by the dealer) which will settle down and make excellent captives. From experience I have found that the first few weeks of new captive life of the mandarin salamanders, whether of wild-caught or captive bred origin (although especially the former), can determine how well it succeeds thereafter. Poor treatment often leads to a rapid decline in the salamanders health, particularly loss of appetite and malnutrition. Therefore it is important to provide at the very least comfortable surrounds and optimum temperatures, photoperiod. light intensity and diet. In addition I found they prefer to be kept isolated during such a period and this allows the hobbyist to determine the health of each specimen. Mandarin salamanders virtually always refuse food during their first few days in a new captive set-up but if given plenty of dark, cool and humid hiding places, a temperature in the 60 - 70°F band, twelve hours of low light intensity (I have found the 7W night-light bulbs ideal) they soon come to terms with their new surrounds. The favourite food (and I have offered these salamanders many types) is most certainly waxworm or tebo's (for larger specimens). These can be dusted freely with multivitamin powder. Once over the initial 'quarantine' period where specimens are frequently emerging from their hides during daylight and taking food regularly, mandarin salamanders can be introduced together into a suitable container. I have found that an all-glass aquarium is quite appropriate as this species does not especially object to the 'openness' of glass. A 36-inch aquarium will quite comfortably house up to four specimens with a 3:1 or 2:2 male to female ratio being preferred where breeding is to be attempted. This must have a secure lid as, like most caudates, mandarin salamanders can escape out of the smallest gaps. Adequate ventilation is also essential. The aquarium must be scaped in the land:water fashion with water being in the form of a suitable bowl or other container or preferably a glass division (see diagram 1). The latter allows one of the small pumps that have recently come on to the market to be neatly located in a corner which aerates, agitates and cleans the water (if an undergravel filter is fitted) - essential where breeding is concerned. The depth should be no greater than 4 inches (10.16cm) at its deepest part, rising gradually out of the water by utilizing rocks and bogwood up to the glass division. The reason for this is that Mandarin salamanders are not particularly adept swimmers although they seem to enjoy bathing. In the main however, during the non-reproductive period they are largely terrestrial. The land section should consist of lots of rocks and bogwood with plenty of hiding places and can be padded out with a moist moss (Java moss is probably the best type as is does not seem to deteriorate like ordinary sphagnum). The aquarium should never be located in a room that catches a lot of sun, especially in summer. Lighting should be quite subdued as mentioned earlier as this encourages specimens to leave their nighttime hiding places in search of food - a habit that is very unusual in caudate amphibia. In normal room temperatures of 68°F., a night-light will not give out much heat. 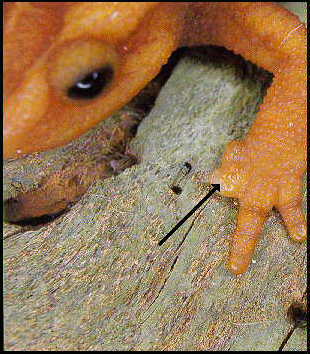 The actual temperature range at which these salamanders are active depends on their region of origin. For instance those hailing from Thailand can tolerate higher temperatures than types from China and Nepal, but are less able to tolerate cold conditions. As most individuals directly or indirectly originate from Thailand it can be assumed that the temperature should be in the 55 - 75°F. range although as low as 40°F. and as high as 85°F. will be tolerated for short periods. Below 50°F. 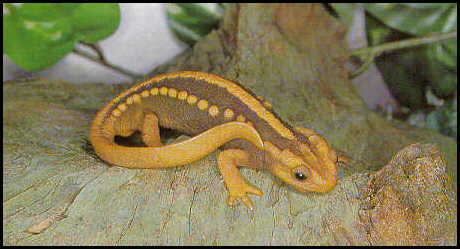 and these salamanders enter a period of dormancy (which proves integral where breeding is to be attempted). Of course it is essential that any invertebrates that have been collected from the garden should be free of pesticide and in the case of earthworms, thoroughly swilled in fresh water. All food can be liberally dusted in multivitamin powder although if the food is varied enough, this need only be at every third or fourth feed. Sexing these salamanders is extremely easy with males possessing a much more swollen cloaca, tending to be rather smaller and more streamlined. They also have somewhat thicker forearms. 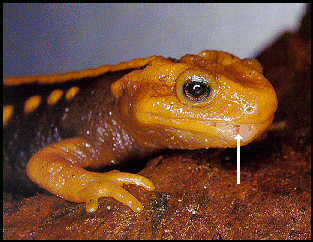 The reproductive behaviour of Tylototriton shows remarkable similarities to the western European/North African ribbed newt Pleurodeles waltl. Usually mating takes place in water. A few weeks after a dormancy period from December to March where the temperature should not rise above 55°F., the male attempts to wrestle a female into the water using his snout and hooked forearms (which he interlocks with the females forearms and drags her along). This may take hours or days depending on the female receptiveness but eventually a successful mating will occur. 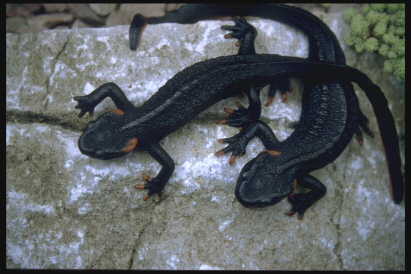 Fertilization is external, the male dropping up to three small cone-shaped spermatophores which he then nudges or drags the females cloaca across. However I have also observed this behaviour on land and sometimes fertilization may occur without there being any contact whatsoever between the two sexes. Females then undergo a 7 - 21 day period of ova development (although sometimes even though a successful pairing is observed no eggs are subsequently laid). She then begin to search in the water for suitable egg-laying sites. In all my own successes, eggs have been adhered in small clumps of 10 - 15 eggs to the side of partially submerged rocks. The normal quantity is within the 40 - 60 range although as many as 100 eggs have been reported. Eggs are about 2mm diameter with a yellowish nucleus. Although Zimmerman reports that eggs should be removed to rearing tanks, I have found this to prove fatal with many eggs spoiling as a result. Therefore I recommend that eggs should be left in situ for the time being although the aerator part of the pump should be switched off as this may prove troublesome to the resultant larvae. I have never known adults to devour their own eggs as mandarin salamanders rarely take food underwater. At a water temperature of 65 - 70°F. the larvae hatch in 10 - 18 days and measure approximately 9mm in length. Allow them to grow on for a period until they are 15mm at which point they should be moved to a large aquaria with about 4 inches of gently aerated water and plenty of oxygenating plants such as Elodea. Initially yellow, they soon turn darker. Food consists of live paramecium, daphnia, brine shrimps, tubifex and bloodworm later turning to Asellus, tiny strips of raw beef, chopped earthworm and inevitably small waxworm! Mandarin salamander larvae are notoriously slow developers taking between 110 - 150 days to metamorphose. During the later part of development the bony ridges and colours begin to become obvious although vivid coloration will not develop until they are six months old. On metamorphosing they measure approximately 1.9 - 2.5 inches (4.83 - 6.35cm) and must be given easily egressable sections of land. Most emerge with remnants of their gills and can be moved to plastic containers of damp Java or sphagnum moss where they will feed greedily on waxworm. Maturity is attained in the second or third year. 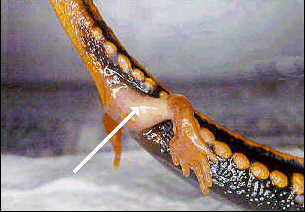 In line with most caudates, mandarin salamanders are relatively resistant to disease. However there are two ailments which occasionally crop up which must be treated in the early stages. Needless to say not only should infected animals be isolated but also the aquarium from where they are taken should be thoroughly disinfected. Swelling of the digits commonly known as 'bumblefoot'. Caused by an undescribed bacterium (probably Pseudomonas) which affects the digits and limbs of mandarin salamanders, these swell to an excessive degree causing much discomfort and eventually the affected area will either split or drop off. If treated with a tropical fish compound such as BSB (Broad Spectrum Bactericide) such as that produced by TAP (Technical Aquatic Products), the condition can be arrested and reversed. Place three drops of the BSB in a pint of water and bath the infected salamander in this for ten minutes twice daily. Almost certainly caused by the either the bacterium Flexibacter coulmnaris, Aeromonas hydrophilia or Pseudomonas vectors, this disease is seen in the form of mouth erosion (especially the lower jaw) but can also spread to the ventral surface, cloaca and underside of the limbs where large open sores are prevalent. Continual treatment by bathing the infected specimen twice daily for 5 - 10 minutes in a strong solution of the Finrot/Mouthrot compounds frequently sold for tropical fish. 5 drops in a pint of water should suffice. I have found that the Interpet and Waterlife compounds are excellent in this respect. Once the disease clears up, treatment should continue for a further four weeks to prevent reoccurrence. Badly infected specimens may require a course of topical or injected antibiotics such as a 2.5% or 5% solution of Ticarcillin, Enrofloxacin or Baytril. Unfortunately such antibiotics can only be acquired on prescription (at least this is the case in England) and are extremely expensive. If correctly treated Mandarin salamanders will not only survive such disease but will show complete recovery with entire limbs or a new jaw being regenerated. However it is cannot be stressed how important it is to treat such diseases early. Sometimes it is better to euthenase particularly badly infected specimens which have lost most of the head, torso or cloca. I have recently acquired a number of very rare but very beautiful black crocodile salamanders (Tylotriton taliangensis) which where actually saved from a Chinese food market in the town of Luizho, eastern China. Occurring in a small area of the southwest mountainous subregion of the western Himalaya's, China, this species is far more streamlined and aquatic and proves to be an extremely 'friendly' species in captivity. 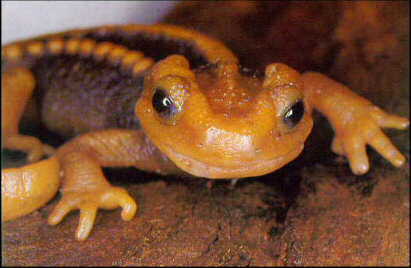 Unfortunately it is also near extinction and I would only recommend experienced keepers to attempt this newt as it will not tolerate temperatures above 60°F.. Attaining 7.5 inches (19.05cm), its dorsum is a inky black with bright orange markings present on the parotid glands, digits and lower tail. I keep my specimens in a very cool aquaterrarium complete with slow-running water (to which I add a 12cm diameter cube of iced rainwater on a daily basis) and a mossy platform with cork bark hides. I have seen my specimens in a Pleurodeles-like amplexus on several occasions but I know my females are not yet properly conditioned (watch this space for details of eggs and larvae as and when they arrive!). Whenever I walk into the room, one or more specimens will poke their heads out expecting a morsel (which they usually get in the form of waxworm, slugs and earthworm.). All in all, a charming, but alas difficult species (unless temperatures can be kept low). So far I have I have not kept any other species of genera Tylototriton or Echinotriton. However, future trips to Chinese food markets in the next year or so may provide me with further surprises.